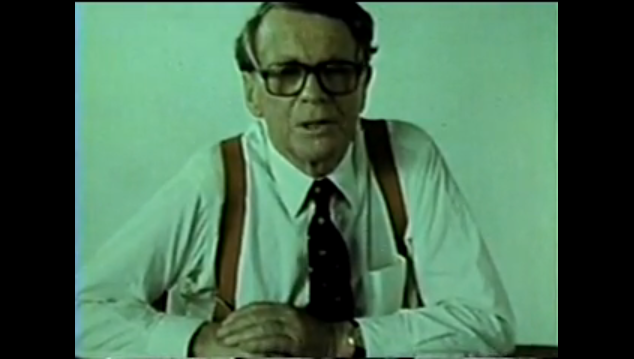 A friend tweeted a link to this video from the legendary David Ogilvy this week. It’s worth a look. Even if you don’t agree with everything he has to say, it’s refreshing – in a world of constantly changing media platforms and seat-of-the-pants marketing approaches – to hear from someone who is “all in” with their marketing philosophy. This paradigm applies to a smaller scale as well. Don’t expect direct returns on the golf tournament sponsorship or the newspaper ad. On the other hand, don’t neglect to build in tracking mechanisms (like unique phone numbers or landing pages) for campaigns that are measurable like email, display ads or direct mail. The lesson here is simple. Know what to expect. If you’re not sure what to expect, try some things out. Or, better yet, talk to a marketer who has experience with the medium you’re considering. If you can find someone as smart and charming as 1950s David Ogilvy, all the better. What’s your take? Have you had success with direct response media? Have you tried? As we near November elections, you’ll notice more and more politicians asking you for your vote. It’s a central principle in political campaigning – ask for the vote. It’s important to ask. It’s important that candidates do it themselves. It’s important to make it personal. It’s important to ask in a straightforward manner without any hint of reward or consequence. Fundraisers have a similar mantra. They’ll tell you that the most important piece of their campaigns is the ask. You’ll never raise any money if you don’t ask for it. But businesses and brands too easily lose sight of the ask. We rename it (call to action), bury it (first register, then download a white paper, then get a free consultation, then we’ll ask you for your business), or just wait for the prospect to do the asking (contact us if you’d like to ask us to work for you). If you have something to sell (and you probably do if you’re reading this blog) consider how you ask prospects to buy it. Is your ask simple and straightforward? Are you making it difficult for prospects to figure out how to hire you? Or, on the other hand, does your ask come across more like a plea? A beg? Make it easy to move forward. “Just click this big, red, gaudy button.” It’s important to reduce the risk of taking the next step. It’s not about luring them in. It’s about starting an easy conversation. Make it unavoidable. Sales calls work because they demand a response. Look for ways to ask for business that strike a nice balance – putting the ball in the prospect’s court without being pushy. REACH has had success with email marketing because it accomplishes all three of these tasks. We ask in a straightforward way. We give recipients a clear path to contacting us. We put the ball in their court. Email (from a person) must be dealt with. If I send you an email, at the very least, you have to click the “Delete” key. But even that is a response. Email forces a response without being rude. And since it’s just as easy to click “Reply” as “Delete” we often get leads or referrals in response to our email campaigns. Would you like to buy a two-day review of your brand and marketing from REACH? If so, click here. In the last two days, I have seen the truth of my favorite marketing model played out in an arena completely unrelated to REACH. Actually, I’ve seen it in my neighborhood. Tonight is National Night Out – a day for neighborhood block parties to promote public safety and neighborly goodwill. (Actually, the nationwide National Night Out happened in August, but a few years ago Texas figured out that no one was participating because no one wanted to have a block party in Texas in August. Go figure. So we’re celebrating the “National Night Out of Texas” tonight. We can do that. We used to be a country.) As we’ve done for the last three years, my wife and I have volunteered to organize the block party for our cul-de-sac in Valley Ranch. We’ll have about 25 people from our block come out for burgers and a bounce house and a lot of fun. What does that have to do with marketing? In the last two days, two organizations have come contacted us asking for permission to pass out literature or present their platform at our party. One is a community group supporting an HOA referendum. The other is a neighborhood gardening club promoting their own event. Unwittingly, Christine and I have organized some customers in the target market for these groups and now they’re asking for access. As long as there are marketers who know how to bring together customers, there will be companies willing to pay for access to them. 1. I will get a handle on my database. I recently mined all of the business contacts from my own address book and came up with more names than either the Chamber of Commerce list I’ve been using or a similar search on Reference USA. That Outlook program you use every day? It’s a gold mine. 2. I will stay on top of my database. Once you’ve finished #1, stay on top of it with weekly or even daily maintenance. You get business cards every day. Don’t let them pile up on your desk or never get past your Outlook contacts. Put them in your database and contact them with your message. Even if they don’t seem like a prospective customer, they probably know someone who is. 3. I will track everything. Refuse to let any marketing message go out the door without a built-in tracking feature – landing page, unique phone number, special offer – anything to gauge effectiveness of the message and media. 4. I will have a plan. It’s a new year. Time for planning! Take advantage of that new year feeling and write out a simple marketing plan for at least for the first quarter of 2010. Even if it’s one ad in one magazine. Just do it. Then you’ll at least have some benchmark to review and expand in the future. 5. I will manage social media. The keyword here is manage. The danger is that it will manage you or it will go unused. Don’t let either happen. Resolve to use it as a tool, but set boundaries lest you become a Twitter tool yourself. 6. I will integrate with sales. The best marketing in the world doesn’t close any deals. Be sure your marketing supports your sales team by giving them what they need. It’s a fine line between guarding the brand and suffocating it. Try to do the former without the latter. 7. I will shoot stuff. On the web, pictures and videos are absolutely essential. Video is the new copy. We spend more and more time online but read less and less. And your web video doesn’t have to be Oscar caliber. Invest in a little camera. Shoot stuff. Load it up. Done. 8. I will work the numbers. How many sales do you need to make this month? What percentage of marketing contacts turn into sales? Do the math and hit your mark. It may mean more work to build that database, but not doing it means betting on long shots. Play the averages. Give yourself a chance. 9. I will not stress. Notwithstanding #8, marketing is an art, not a science. Let yourself fail. Learn from your mistakes. Yes, times are lean right now but fretting won’t improve your CTR or your revenue. 10. I will create beauty. You MUST be passionate about your message. If you don’t believe in what your selling, no one is going to buy from you. If your marketing has gotten stale or burdensome, stop what your doing and retool. Create a message and identity that you want to wear on a t-shirt and shout from the rooftops. Refused to be ashamed of your marketing any more. Two weeks ago, when I spoke to a lunch crowd from the Irving Chamber of Commerce, I mentioned that there are no rules yet in Social Media. No best practices or industry standards. Last week, this article in the Wall Street Journal proved my point. There’s no standard approach to these things yet. Every respectable business in America knows how to approach a web site. You hire an agency or at least a freelancer. You don’t try to do it yourself. But you do guide the process, provide content, explain your requirements and expectations. When the Internet was new, these steps were not taken for granted like they are now. No one knew how web development was going to evolve. Was this something only for “the big guys”? Was there more we could do online? More community-driven interaction? And did every web site have to have those little, spinning, animated GIFs? Likewise, there are still questions about Social Media and its evolution. Will it become the domain of communications experts or will it insist on being so personal that it can’t be outsourced? Will it learn to funnel and track conversions and revenue or will it stay in the realm of its intended uses with no better corporate goals than “raising awareness” and “creating a following”? And where will the price point land? The article below cites firms paying $400 per month and $20,000 per month. The disparity in quality of service is not that wide. The chaos in the marketplace is. We’re not there yet. We don’t know how this is going to shake out, but we do know that it will continue to evolve. Savvy agencies will stay ahead of the curve – testing, reading, pushing the edges of the Social Media model. Agencies that take the “wake us when this makes money” approach will soon find themselves behind. The trajectory of Social Media for business depends in large part on agencies. If we stumble into this realm without thinking any farther than, “Hey, I can tweet for you,” we’ll do ourselves a disservice in the long run. We have to think critically and strategically about Social Media and its effects – good and bad – on our clients’ images and marketing budgets. We will be the ones who decide if Social Media become a standard component of corporate marketing plans or a fringe medium sharing time with Fax Blasts and the Yellow Pages. This doesn’t fit our current models. Agencies and corporate users of Social Media have to stop trying to pigeonhole these services in current categories. This is not advertising in the sense that we broadcast our message for others to hear. This is participatory and our customers have a voice. This isn’t PR earned with 3 martini lunches, charitable donations and clever press releases. It’s more powerful than that. Imagine a media placement with a “click here to respond” feature. It’s huge! And it’s not direct marketing in the sense that it’s only there to sell something. Social Media doesn’t fit our molds. We have to be careful not to force it. So enough opining. One more thing before you read Sarah E. Needleman’s work: I found it interesting that Back of the House USA LLC is paying between $5,000 and $15,000 per month on Social Media but I can’t find them in a Google search. As enticing as Twitter is, maybe there should be some standard practices about getting our SEO down pat before we start tweeting about this week’s coupons. Sylvester Chisom began paying a consultant last summer to blog on Twitter, post status updates on Facebook and run marketing campaigns on both sites for his auto-detailing business. He thinks the service, which costs $450 a month, is worth it. “It’s just better having somebody else dedicated to thinking of stuff to put up,” says Mr. Chisom, co-owner of Showroom Shine Express Detailing LLC in St. Louis. Some small-business owners, overwhelmed by the time commitment required of marketing their products and services via social media, are hiring consultants to lend a hand. But the price of such support can vary widely based on the extent of work involved, and many entrepreneurs with already meager resources for marketing and advertising may need to think carefully before taking on the extra cost. Today we’re starting a Top 10 list. From the home office in Irving, Texas, check here for the Top 10 reasons that a slow economy is the best time to invest in marketing. #10 Sell Something: Sales are more important than ever. And sales don’t happen by themselves.